My trip to Moscow in May this year debunked many common stereotypes I’ve heard about the Russians and their wonderful country. Many Singaporeans’ impression of Russia comes entirely from Hollywood movies and western news which were often biased against them. The common shallow stereotypes of Russian people include mafia; spies; hot babes and communist.Before my visit, I did not have much understanding about Russian history and culture other than their participation in World War 2, Cold War and the fall of communism. 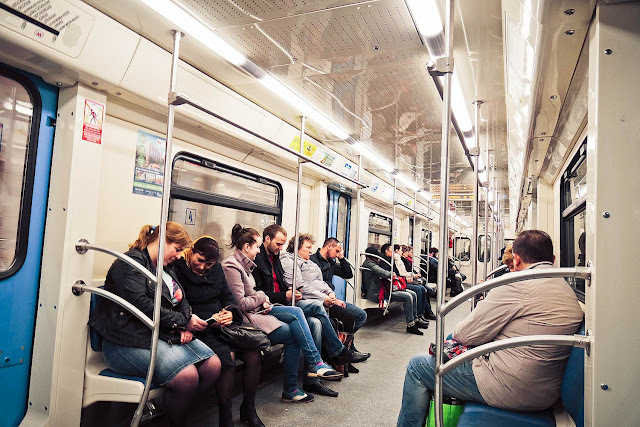 Metro service in Moscow is much better than Singapore’s MRT. Frequency is higher; time taken to travel between stations are shorter and most importantly, the trains are much less packed compared to Singapore! In fact, I would go as far as to say it is comparable with Hong Kong’s MTR. Why so? There are plenty of reasons. 1. Metro frequency – trains are much more frequent here and frequency is about 2 to 3 minutes. 2. Time taken to travel from one station to another is much shorter – an average of one minute. 3. Trains are much less packed compared to Singapore despite the fact that the metro transports 7-9 million people a day, more than London and New York. 4. Value for money – Even with many perks, the train service is also extremely affordable costing less than SG$1 for a single ride. 5. 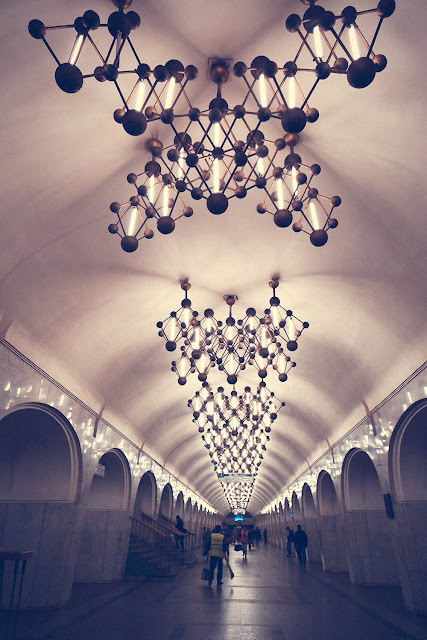 Almost every station is also a work of art itself. 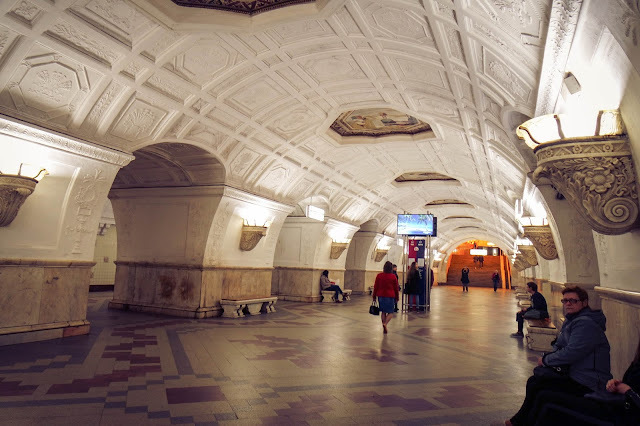 In fact, visiting the different stations is like talking a walk through Russia’s history from the fantastically Baroque marble and granite detailing, to the steel structures of the post-Soviet era. One of the stations which impressed me was the Ploschad Revolyutsii, the station of the Red Square. It was opened in 1938 and features 76 magnificent bronze statues of soldiers, farmers, schoolchildren, workers and a whole host of other characters who contributed to making the country successful. One of the statues, a dog, is said to bring good luck to those who rub its nose. A lot of people think Russians are cold and uncaring because it is not in their culture to smile a lot. Their culture does not encourage smiling at strangers: this is interpreted as insincerity. However, this certainly doesn’t mean they are people incapable of love and care. Throughout my rides on the metro, I see people giving up seats almost immediately when they see an elderly person. They even give it up to middle-aged people in their 50s. What most impressed me was their gratefulness towards the elderly. During Victory Day which is meant to commemorate the defeat of Nazi Germany by Soviet forces in Berlin. During the week, I saw many young people coming out to the streets distributing carnations and thanking the elderly for fighting in the war. They also organized their own performances for them. What was pretty obvious to me was Russian’s love for reading and educating themselves. I’ve been to more than 20 European cities and in Moscow. Unlike the other cities where street vendors primarily sell keychains and friendship bands, Moscow was the first city where I saw so many vendors selling books. They would just lay a mat by the side of the street and display their books there and the crowd would come to them. In the train, I’ve also observed that Russian people were reading everything from classical literature to translations of contemporary foreign authors. I did some research and found that Russians generally value education greatly and have good knowledge of world history, geography and the arts, and this is true regardless of the person’s education or occupation. In Russia, 94% of adults aged 25-64 have completed upper secondary education, much higher than the OECD average of 75%. A good example will be popular super model, Xenia Tchoumitcheva. Despite having a promising modelling career, she insisted on completing her university degree and secured finance internships in top banks such as Merrill Lynch, The London Hedge Fund Duet Group and JP Morgan Chase. Contrary to popular opinion, Moscow isn’t that dangerous. We get that impression because many Hollywood movies portray Russia to be rife with Mafia, criminals, explosives, guns etc. I would say that it is just like any other metropolitan city such as New York, London and Paris. As long as you walk on main roads, don’t get drunk and don’t walk back home alone if you are a lady, things will be fine. Throughout the course of my trip my partner and I have ventured out till almost midnight in the city and nothing happened to us at all. In fact, I think in cities which attract more tourist in France, Spain, Italy and Greece, the likelihood of you being pickpocketed is much higher. With Rubles at an all-time low, this is definitely a good time for Singaporean tourists to visit Russia. I will be doing up another post about the top 10 attractions in Moscow so stay tuned!